Vibration welding creates high-strength, leak-proof hermetic seals with most thermoplastics and is useful for assembling irregularly shaped parts. It uses frictional heat generated at the joint interface of two parts to be welded to melt the plastic. The photo on the top shows a standard vibration-welded PC to PC/ABS part. The photo on the bottom shows the same part welded with CVT. Vibration welding has been a process of choice for quite some time in applications that have complex geometries, especially for materials that are difficult to weld, such as glass-filled nylon, polypropylene and polyethylene. Typical applications include, but are not limited to, automotive air conditioning ducts, power steering and brake reservoirs, air intake manifolds, appliance pump housings, rinse dispenser housings, chain saw housings, leaf blower housings and toys. Vibration welding is accomplished by holding one component in place and creating a reciprocating linear motion under force by the mating part. The frequencies range between 100-240Hz at an amplitude of 0.030″ to 0.160″. Machines are designed to return the mating parts to their original position for proper alignment. The advantages of vibration welding include relatively short cycle times when compared to other non-ultrasonic processes. Virtually all thermoplastic materials (crystalline, semi-crystalline and amorphous) can be successfully welded using vibration welding. Large, complexly shaped parts can be welded. Vibration welding is very tolerant regarding the heat history of a material, additives, colorants, fillers and even environmental contaminants, such as dust, paint and grease. Multiple parts can be welded in a single cycle, and energy usage is low. A wide range of tooling (both in terms of size and type) can be put into the same machine, rather than requiring a dedicated machine or tool set. High strength, hermetic seals are possible. (Nearly all vibration applications must be leak-tight in one way or another – dust, air, water, blood, toner, ink or helium.) “Corrective” melting is possible, in the sense that energy can continually be imparted into the plastic parts to overcome a degree of part inconsistency. Vibration welding does not adversely affect internal components, such as printed circuit boards. Clean Vibration Technology (CVT) is a newer methodology that often is requested. In this method, the weld interfaces are precisely preheated with an infrared heat source and then vibration welded together. This technique provides all of the advantages of vibration welding, but minimizes the flash and particulate that typically are formed in standard vibration welding. The parts are loaded in the same way as in vibration welding; however, an infrared heat source is brought in to precisely heat the weld interface. Once the infrared heat source is removed, the parts are vibration welded. and industrial PC-controlled servo drive with fewer parts and no hydraulic oil for a more energy-efficient operation, plus reduced maintenance and downtime. 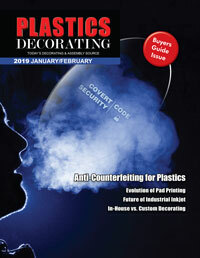 Plastic joining solutions continue to grow as the industry places greater demands on the applications. Jeffrey Frantz is director of North America Business Development, Branson Ultrasonics, a business of Emerson. Branson is the global industry leader in customer-focused solutions for plastic joining, ultrasonic metal joining and precision processing. Frantz brings over 40 years of plastic joining expertise in ultrasonics, vibration, spin, hot plate, laser, infrared and thermal welding to the Branson team. Currently, he is chairman of the American Welding Society Ultrasonic Welding Committee and a member of the Board of Directors, SPE Decorating & Assembly Division. For additional information, email Jeff.Frantz@Emerson.com or call 203.796.2223.